I noticed some odd recurrences my research. Whether I was reading about the ancient Maya, the San people, Aborigines, or any other ancient culture anywhere in the world, I kept noticing two rather conspicuous characters popping up: The tall Six-Fingered Man and The Bird and Snake Goddess. Seen in the visions of Siberian and Amazonian shamans alike, these two icons were always too similar to ignore. Then lets suppose that because of all of these synchronicities within cultures that ostensibly never interacted with each other, these mythological characters were in fact real beings. 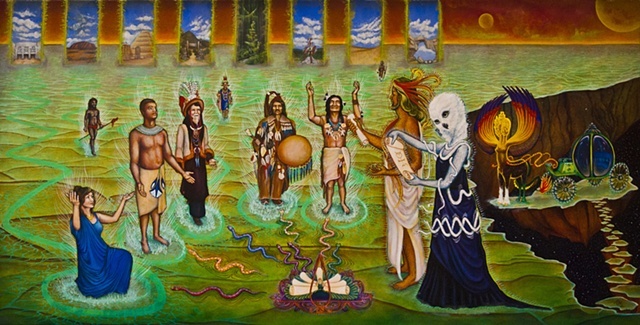 At some time between the years of 3,000 and 1,000 B.C., eight seekers had been transported each from their own worlds, from lands that are now called Malta, Australia, Egypt, the Himalayas, the Amazon forests, Siberia, North America and Africa to an inter-conscious astral realm, walking a great distance to take their place amongst the gathering. The Six-Fingered Man and the Bird and Snake Goddess had just arrived in their interdimensional space carriage, led by the anthropomorphic History of God. They welcome and greet each pilgrim and prepare to teach the initiates the secrets of the universe, the knowledge and wisdom of the ages beyond time that they in turn, will take back to their societies to pass along in the great stream of consciousness. This is still a work in progress. I will update this page soon!